If you are going to write a fantasy novel, it helps to research various cultures – most especially the medieval culture. 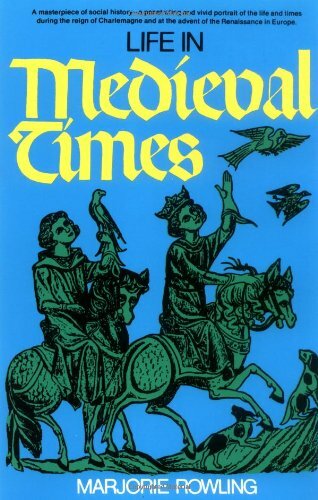 A great research book is the “Life in Medieval Times” by Marjorie Rowling. Get ideas for your fantasy culture by reading about lords and vassals, townsmen and traders, or monks and friars. The research book starts out with the time of Charlemagne. It describes the man as well as the times he lived in. Things changed after Charlemagne’s death. Internal battles became more frequent and the scholarships through churches diminished. Feudal estates began to become more prevalent which tied the people to the land and their lord and the lord to their vassal. Other things I learned in the research book “Life in Medieval Times” include the rise and development of the mounted knight, the devastating effects of the Black Death, the influence of the great international fairs of Europe, the inferior view of women, etc. The research book goes over common medieval dishes, games, clothing, occupations, and so on. Occupations the “Life in Medieval Times” touches on include that of warriors, monks, scholars, artisans, doctors, astrologers, and more. 1. Charlemagne & Society – Books were rare, expensive, and subject to thievery. 2. Lords & Vassals – Allods were lands free of service to vassals but sometimes when an allod needed military protection, they surrendered themselves and their land so that the lord could give it back as a fief. 3. Townsmen & Traders – The process of making cloth was divided into workers who specialized as drapers, weavers, warpers, spinners, spoolers, fullers, and dyers. 4. Women & Wives – While the role of women was viewed as inferior, they did gain some status and value when they men went on crusades. 5. Pilgrims & Crusaders – Ordinary people going on a pilgrimage faced a number of harrowing trials including famine, living in filth, disease, robbers, etc. 6. Monks & Friars – Various religious orders and different rules of behavior. Different orders include St. Bernard, St. Bruno, the Carthusian Order, St. Dominic, St. Bernadino, and the Order of St. Benadict. 7. Schools & Scholars – Education for a nobleman might include reading, chess, backgammon, hawking, hunting, fencing, geometry, magic, and law. 8. Church Builders & Artisans – Stone building were erected under the supervision of a master mason and wooden structure under a master carpenter. 9. Doctors & Patients – Surgery was strongly frowned upon and left to barbers. 10. Scientists & Technologies – Secular knowledge was frowned upon by the church but there were still a few scientists such as alchemists and astrologers. Perhaps we don’t want our fantasy novel to be exactly like medieval times. We want to romanticize it a bit, don’t we? Depending on the message we are giving in our fantasy novel, we may want to give our women a stronger role, make our castles more like palaces, or downplay some of the dirtiness of the cities. Reading “Life in Medieval Times” can give you some great plot or character ideas. With your newfound knowledge you can build your own believable order of knights, create conflict with your information on the roles of the king vs the church, establish your own sumptuary laws, create your own guilds, and so on. With a fantasy novel, the possibilities are endless but it helps to have a foundation of knowledge. If you enjoyed “The Third Dragon: Book One of the Dukarian Legacy” by Dawn Ross follow up with the newly released Kindle version of “The Raven’s Fire: Book Two of the Dukarian Legacy“. If you don’t have a Kindle, you can download Amazon’s Kindle for PC for free and read away! Lord Kildas Lakast of the Raven clan is cursed by the mysterious People of the Dragon. Everyone he has ever known, including his wife and children, must beware the perils of the fire demons or be burned. To relieve the Curse of Fire, Kildas must travel into the enchanted Andagaran Mountains and find an egg of a dragon. In the meantime, Tomis Dukar and his friends are attacked and held hostage by brutal Outlanders. The Outlander leader, Thorolf, threatens to take the lives of the Prince and Princess of Upper Ungal if the Crown of Creation is not given to him. With this Crown of the Gods, Thorolf could rule the world. Tomis is tempted to use his magic to kill Thorolf, but if he uses this blessed gift to bring death, the Prophecy of Peace will no longer hold true and the Brother of Death will prevail. Tomis’ cunning and the Curse of Fire may be all that can save him and the people of Ungal. Sorry I missed Saturday’s post. My mother is in the hospital so I have not been home for the past few days. It all started with her emergency visit to the hospital for her heart. But upon scanning her heart, the doctors noticed a few black spots on her lungs. We later found out that the “spots” were actually tumors taking up at least half her lung. The tumors are also in her lymph nodes and possibly elsewhere in her body. When they did a biopsy to see if the tumor was benign or malignant, her heart started causing problems again and she went into cardiac arrest. This happened four times before they were able to stabilize her. Her heart was being stabilized with a pacemaker and she had to have a breathing tube to assist in her breathing. The doctors were not sure if they would be able to revive her if she went into cardiac arrest again. And they were not sure if the cardiac episodes had caused brain damage. But when they took the breathing tube out the next day and eased her off the sedatives, my mother was mostly herself. She was tired and sore, but she was alert and had no idea of the close call she had just had. It was a miracle! Unfortunately, the biopsy confirmed lung cancer. The good news is that it is single-cell and treatable. The bad news is that the cancer is possibly very wide-spread. She is getting an MRI today to confirm. Until we know how wide-spread it is, we will not know her chances. We are also unsure about her heart. The heart doctor said that her heart is strong so he has no idea why she went into cardiac arrest. Was it the cancer, the drugs, or something else? The heart doctor did remove the pacemaker so my mom could get a full-body MRI and she did fine. But I, for one, would like him to put it back in until he is certain as to what caused the heart issue to begin with. I published “The Raven’s Fire” just before this all happened but didn’t have a chance to tell you about it. “The Raven’s Fire” is a sequel to “The Third Dragon“. It is available on Amazon in the Kindle version only at this time. If you don’t have Kindle, you can download Amazon’s Kindle for PC for free. Depending on how things go with my mom, you may not see a new post this next Saturday. Please keep her in your prayers. As promised last week in my post on how to write a prophecy for a fantasy novel, here are a few of the prophecies in my books, “The Third Dragon” and “The Raven’s Fire”. First, “The Third Dragon”. This is part of the prophecy which is prevalent throughout the fantasy novel series. You will find that some characters remember the words differently and interpret them in their own way. And a red moon rises followed by an eclipse of the sun. The fate of the Third Dragon has been set into motion. The Third Dragon will grow to set the hidden Lion free. Their lives intertwine bringing together two great legacies. Come together and make their peace. Take the beast and show him the light. None will be left to mourn the loss. If it does not stop, the land will quit breathing. Beast of Darkness; Child of Light. The son of the Dragon can set the world right. If the Dragon is not there to break its fall. A man will try to defy destiny. He will bring harm to those so near. Yet shed not a single tear. When the choice is made to kill. Now from “The Raven’s Fire”. This isn’t so much as a prophecy as it is vague instructions on how to get to a dragon’s lair. In my second fantasy novel, “The Raven’s Fire”, Lord Kildas must go to a distant place and steal an egg of a dragon. “The Raven’s Fire” will be available soon as an e-book on Amazon (soon meaning within the next week or two). Silver River’s end is where you begin. Head northeast through the pass of Borden. Sleep at dusk, awake at dawn. For ten perilous days you will travel on. To make the invisible seen. So don’t give them kisses. In you have come, now out you go. Follow the headstones in the snow. Magic to heal causes pain. If this same magic is used to harm someone, creates pleasure. What if our hero has to hurt someone with his magic in order to save someone else? Will he discover the pleasure of it and fall into the trap? This is all answered in “The Raven’s Fire”. By using his magical skill. He will be breaking ancient laws. Magic used to heal could turn into a curse. If it is used to kill, the fate of man will be worse. And bring an end to the Prophecy of Peace. Most of these prophecies are from my first two books in the Dukarian Legacy fantasy novel Please visit Amazon.com now for “The Third Dragon” available in both e-book and paperback form. “The Raven’s Fire” is now available on Amazon as an e-book. Both are available on my author page for D. R. Ross.